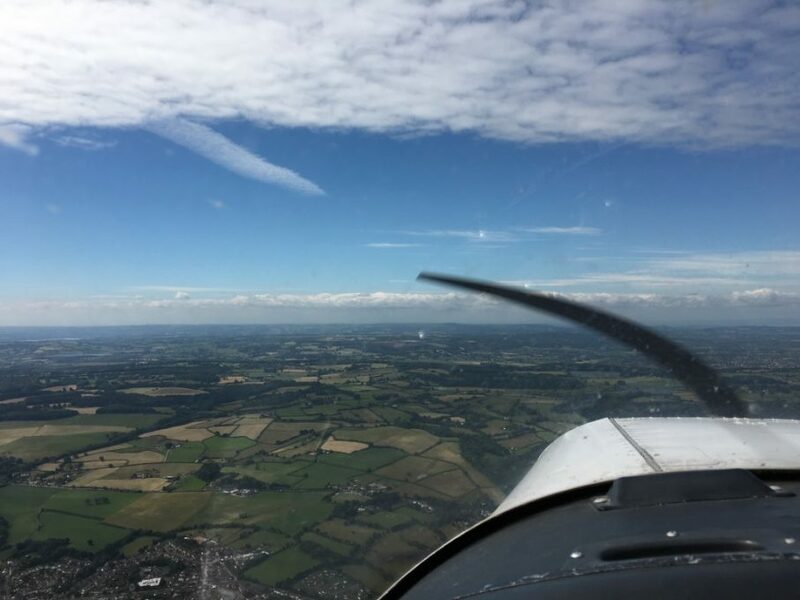 It was getting close to 4 weeks since I last flew, the flying club I am a member of has a 30 day currency rule so I had decided to do a self fly hire but keep the flight short but ensure it would be worthwhile and allow me to practice some key skills and basically keep current. The aircraft for todays flight was G-AXTL a Piper PA28-140 that I had done the majority of my training in. Despite not flying for some time I wasn’t nervous or had any doubts in myself as I knew I was still confident and safe to fly. After completing the usual aircraft check, which I wont go into detail in this post, I booked out with the op’s desk to leave via the Avonmouth Bridge for a local flight around North Bristol. The wind today was from 100′ meaning a departure on runway 09 via taxiway HX with a temperature of 16’c at 10am. After starting, completing my taxi checks and power checks I was ready for departure. The weather was perfect, clear skies, little wind and great visibility, after clearance I entered the runway and backtracked a little as this isn’t one of the most powerful aircraft in the fleet. Following clearance for take-off I advanced the throttle and was soon rolling down the runway before rotating and climbing to 500ft before making a left turn towards Avonmouth Bridge. On the way I changed to Bristol Radar and requested a basic service and was now able to begin my general handling practice. Passing Bristol Filton on my right I climbed up to 2500ft and continued on a heading towards Gloucester, but knowing I wasn’t going to be travelling that far. Around the Thornbury area was suitable to make my practice manoeuvres. I initially started with some steep turns, initially to the left and then to the right, I completed these successfully without losing more than 100 feet of height. After those I leveled off and flew level heading directly north, making sure I was clear of built up areas and ground obstructions I chopped the power and simulated a PFL, trying to make it as realistic as possible. With the engine now at idle and sorted out the carb heat I picked a field to my left and began to head for it using the technique I had learnt during my training, flying a pattern like a circuit at an airfield. Just before I got to 500ft I advanced the throttle to full and climbed away taking the flaps off in stages. I performed another PFL as I wasnt happy with how I executed the first in terms of picking a field and my height keeping. The second practice was alot better and I would of safely made it into the field that was clear of animals, water, ruts or fences crossing it. Following the second PFL I throttled up, climbed to 2500ft and headed back to Avonmouth where I would rejoin the circuit and get back into controlled airspace. Approaching Avonmouth Bridge I was now at 1800ft and made my radio call to enter the Bristol CTA. I was cleared to enter not above 2000ft VFR and given instructions to join left base for runway 09 which takes you directly between Nailsea and Backwell. I got my pre-landing checks in early before approaching these two villages and was setup on left base, I was then given early clearance to land on runway 09 as there was no inbound traffic and the airport was quiet. I’m not a fan of landing on 09 at Bristol due to the landscape and terrain as the ground rises up to you sharply on approach, daft I know as we can’t choose favourites! My landing was smooth with light winds so no crosswind technique was required, exiting the runway by HX I then completed the after landing checklist, once complete I parked the aircraft back where I started and carried out the shutdown checks. Another successful flight to keep current lasting just 40 minutes.